As a child, Sophia Summers always knew she was different and misunderstood. Hers was a lonely life of obsession and passion, fraught with anxieties, vulnerabilities, confusion, and heartbreak. It wasn't until her son Josh was diagnosed with Asperger's Syndrome (AS) that Sophia sought her own eventual diagnosis with the same-and began her mission to fully research and understand AS and to discover and embrace the special way the brains of those with Asperger's are wired. 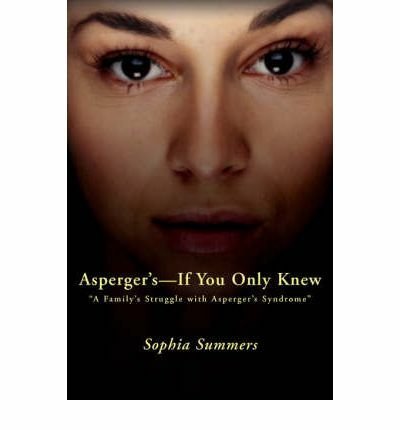 In Sophia's remarkably candid and deeply personal memoir, she offers firsthand insight into the unique challenges and experiences of both living with Asperger's Syndrome and raising a child with AS. With the kind of clarity that only comes from true acceptance, Sophia shares the many practical and emotional coping skills she and her son have developed over the years for people in the spectrum of autism and their families, mental health professionals, and teachers. "Asperger's-If You Only Knew" is a triumphant true tale about coming to terms with one's essential self, trusting in others, welcoming laughter, and realizing one's true potential. It serves as an invaluable source of comfort, hope, and guidance to anyone touched by AS.